The Electra Forums • View topic - Omega "color switches"
Post subject: Omega "color switches"
Can anyone explain exactly what the Omega color switches do? Coil tap? I've looked around a little here and cannot find a clear explanation. 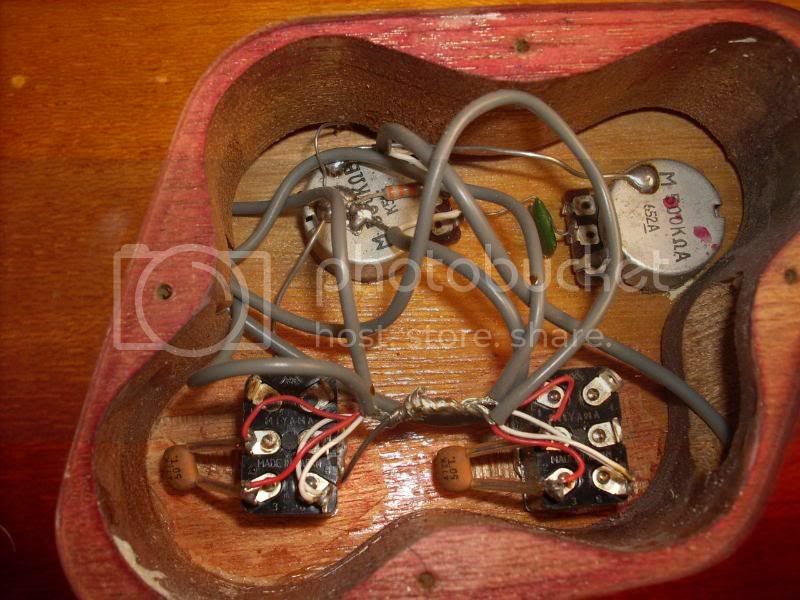 Post subject: Re: Omega "color switches"
I do not own an Omega, nor have I seen any close ups of the control cavity... having said that, I believe they are hooked up to capacitors and either add or subtract bass frequencies. It seems like if they were just Coiltap switches, someone would have said that by now. Maybe we could get ChampAmp to take some pictures or at least chime in as he has one of the cleanest Omegas I've ever seen. I think Thorny is pretty familiar with that guitar too. The color switches on the Omega models do indeed add a tonal boost. One switch adds a bass boost for rhythm and the other a treble tonal boost for leads. They sound very nice and when used in conjunction with the 5 way switch for in a nd out of phase and coil tap and the tone knob you get a great variety of endless sounds and combinations. Not certain exactly how the boost is done as I have not looked into the electronics or pots on mine yet as I am to busy palying it every time I pick it up. Hope this helps. I'm not sure of the values, but there are those caps on each switch, typical tone cap on the tone pot, and a resistor on the volume pot (probably a treble bleed circuit of some kind). Hope it helps... Mike. Should have read this thread before I posted my ignorance about these switches in the other one! What size pots are those in the omega? Are they short or long shaft?